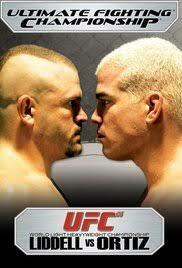 Chuck Liddell and Tito Ortiz gave the UFC its most successful show to date at UFC 66. Their clash for Liddell’s light heavyweight title drew more than 1 million pay-per-view buys and over $5 million at the box office. Liddell controlled the fight most of the way and retained his title with a TKO in Round 3. In the co-main event, “The Dean of Mean” Keith Jardine beat Forrest Griffin by TKO at the 4:41 mark. Jardine floored Griffin with a combination before pounding his way to victory. Jason “The Athlete” MacDonald scored the Submission of the Night, defeating Chris Leben with a guillotine choke in Round 1. Former UFC heavyweight champion Andrei Arlovski knocked out Marcio Cruz at the 3:15 mark. TUF 3 winner Michael Bisping kicked off his UFC career with a TKO win over Eric Schafer in 4:24. Thiago Alves knocked out Tony DeSouza with a knee strike in a preliminary bout. In other pre-show fights, Christian Wellisch beat Anthony “The Hippo” Perosh by unanimous decision; Yushin Okami made Rory Singer tap out to strikes in Round 3; and Gabriel Gonzaga submitted Carmelo Marrero with an armbar at the 3:22 mark.